The sequence of year classes (Fig. 10.5) provides a much better sense of what happened over this period than a stock-recruit plot without temporal changes. It is clear that there was a period of low relative survival in the mid-1970s followed by much enhanced survival from 1980 onwards. This enhanced survival cannot be attributed to increased stocks. The opposite appears to be true (Fig. 10.6). One possibility is that the main causative factor was variation in the transport of larvae from the northwestern spawning grounds to the southeast nursery areas. This hypothesis, proposed by Corten (1986), is based on larval survey data for the years 1976-83.
the North Sea, or whether exchanges with the Northeast Atlantic and the Norwegian Sea play a role (Dooley, 1983), thereby linking the North Sea changes with larger-scale variability in the North Atlantic (Dooley et al., 1984). Recently, Bartsch et al. (1989) have modeled the winter transport of larvae and demonstrated that advection is an adequate mechanism to take larvae across the North Sea. However, the actual distances depend critically on specific features of larval behavior, specifically diurnal vertical migration. Thus, more work is required before these models can be used to explain particular past recruitment or predict future large-scale changes. Further, variations in such models depend solely on changing patterns of internal wind-driven circulation. The probable role of year-to-year differences in circulation may require knowledge of variations in baroclinic components arising from variable inflows. 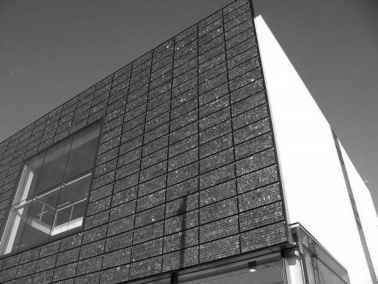 Yet, the general picture emerges of a dependence on large-scale features in the physical dynamics. Whichever of the above hypotheses is correct, there is no doubt that recruitment was anomalous during the late 1970s, which must have been due to a large extent to anomalous environmental conditions. It should be stressed, however, that the role of spawning stock size has not been adequately investigated in relation to recruitment to the individual stocks within the North Sea (e.g., the collapse in recruitment to the southern North Sea herring stock in the 1950s). Such studies are intractable in retrospect. 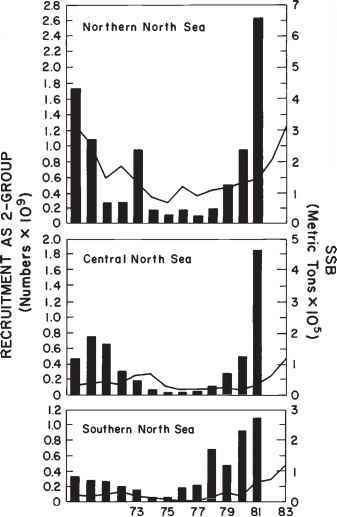 Whatever the true answer is for North Sea herring, the recruitment/stock scatter plot (Fig. 10.5) shows that the variation of recruitment at a given stock size is considerable. It is also clear, however, that fishing acts in a depensatory manner. As the stock size of herring decreased, the area of distribution also decreased (Burd, 1974; Saville & Bailey, 1980), so that herring did not become proportionately more difficult to locate. Moreover, the shoaling behavior was maintained so that large catches could still be made. In other words, the catch per unit fishing effort did not change in proportion to the change in stock size. While this is difficult to demonstrate in the absence of fishing effort data, there is a clear inverse relationship between fishing mortality rate (a measure of the proportion of the stock taken) and the stock size (Fig. 10.7).